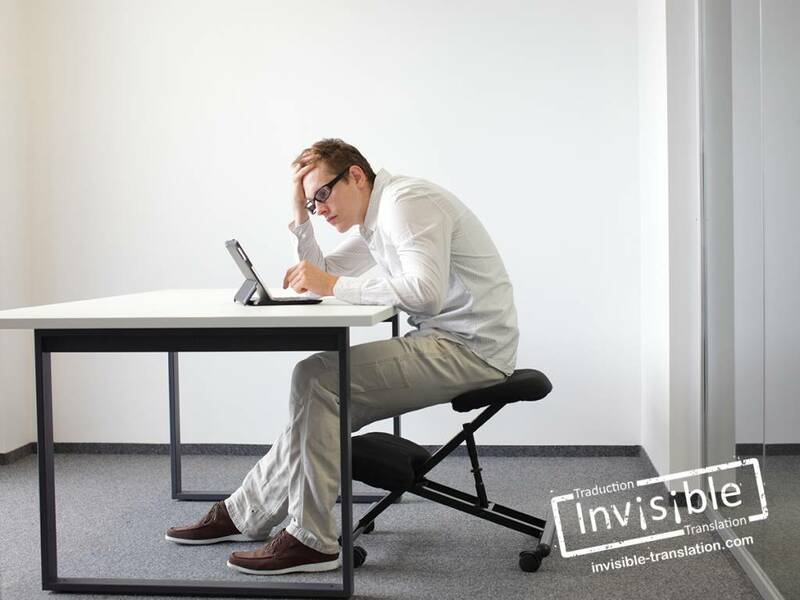 Making your workspace more ergonomic | INVISIBLE Translation Inc.
To do the same work over many years, your body must be able to keep up with the demands you place on it. That’s no big secret, right? Office work, sitting for long periods and especially using a computer all day pose genuine problems. Earning a living becomes a challenge when your back aches, you have recurring tendinitis, and your vision is deteriorating faster than it should. On World Day for Safety and Health at Work, our team thought it would be good to share a few practical tips and introduce you to some tools you might not know are available. So, let’s get right down to ergonomics. A good quality chair is the keystone of your health strategy. Unlike a normal side chair, a proper office chair has armrests, which are vital to reduce tension in your shoulders. The chair supports each area of your back. If in doubt, seek advice from a qualified ergonomist. Stand up every 30 minutes and walk up and down the office hallway. Before you sit down again, stretch your wrists, arms and legs, and shake your hands to stimulate blood circulation. Also flex your neck and rotate your head—but gently! If you have a balance ball, lie on it on your back to flex your spine in a convex curve. Consider using a work table with an electric height adjustment, like these. That way, you could work standing in the morning and then move to your chair after lunch. It’s our bet your body won’t be so slumped by the end of the day. Repetitive movements cause all types of injuries, but one of the best known is probably carpal tunnel syndrome. Placing your keyboard and your mouse in the best position will avoid many problems in both the short and the long term. Use a keyboard drawer or similar device to adjust the height and tilt. If you feel pain when you press the keys with your fingers, consider buying a mechanical keyboard. Do you have broad shoulders? There are ergonomic keyboards specially designed for those with broader torsos. Science-fiction fans will even find models with a look right out of the future. A mouse is just as important, or more so, than the rest and many options are available. A good practice is to regularly place your mouse on the side of your non-dominant hand (on the left if you are right-handed, for example). This distributes muscle use more evenly, thus reducing the risk of injury. However, you will have to allow yourself time to adapt. Also try to memorize a new keyboard shortcut every week to avoid the endless back and forth between keyboard and mouse. The monitor should be directly in front of you, and fingertip distance when you extend your arm. The screen should be tilted back 15 degrees to optimize comfort, and the top should be positioned at eye level. Invest a few dozen dollars in a good quality adjustable stand, especially if you use more than one monitor. Your eyes and your neck will definitely thank you. An ergonomic work space should be a top occupational priority. The Commission des normes, de l’équité, de la santé et de la sécurité au travail (CNESST) has published a guide covering certain aspects of our overview, and also provides advice on using a laptop or notebook computer. This document makes a good starting point. If your work is causing you physical discomfort every day, you should contact a specialist without delay to correct the situation. Do you use tools we haven’t covered here? What measures have you taken to make your workstation more ergonomic? Send your comments to feedback@invisibletranslation.com. A quarterly medley of info from INVISIBLE Translation!